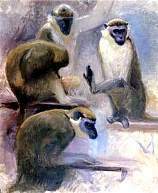 Most Monkeys do not have a highly developed sense of morality. Indeed, if its fun, they’ll do it. Their primary goal is the pursuit of their own pleasure. Monkeys make pleasurable, exhilarating lovers, but beware of the possibility they will stray. Monkeys will try anything once, and if it is the slightest bit entertaining are sure to try it again. The Monkey’s self-serving attitude may be trouble for many other Signs of the Zodiac. They are very hedonistic and lacking in self-control. If they cannot find a party they will start their own.